Please refer to our stock # BNJprIrishDe when inquiring. 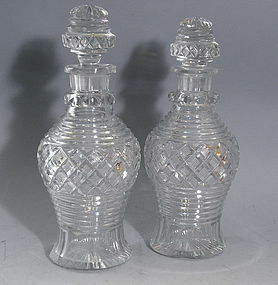 Rarely do you find a pair of early 1800's Anglo Irish cut crystal decanters complete with their original stoppers. They are in excellent condition for their age with just a few small chips. The most notable is a chip on one of the bases that you can see when turning the decanter upside down. The decanters are stable, don't wobble, no hairlines, and no cracks. Measure about 9.75 inches high, diameter about 3.75". Dates Circa 1800-1850.